I wasn’t going to visit Singapore during my travels through Southeast Asia these past few weeks. That doesn’t mean I didn’t want to visit. In fact, I’ve wanted to for decades but for a variety of reasons just never made the trip. This time, though, I crossed it off my list because I heard the Zika virus had been found there. But then a friend, bubbling over with enthusiasm about the virtues of Singapore, urged me to reconsider. I checked with the U.S. Center for Disease Control (CDC) and found that things weren’t as dire as I had imagined. Consequently, I finally took my friend’s advice, and I’m glad I did. Singapore is unlike any other city you’ll ever visit. It’s a beautiful, modern metropolis that’s also historical and overflowing with green space. Here is heaven for foodies, and paradise for lovers of art and cutting-edge architecture. A place of pure joy for those who love slightly exotic travel. And for those who enjoy upscale hotels and 21st-century amenities at the same time. Singapore’s Changi Airport, often rated as the best in the world, is excellent and works well. As a result, it’s such a dream for travelers. In fact, after a half-hour I felt sorry for those arriving by ship. A few hours later I also soon found myself wishing I could stay longer than the three nights and two days I had allocated for my stopover. 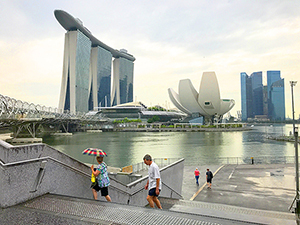 In addition to its green space, one thing about Singapore that knocks you back is its hypermodern architecture, which melds well with the historical elements of the city. You’ve probably never seen anything like it. Anywhere. It’s creativity on steroids and has become the image of the city for millions worldwide. Perhaps its most noteworthy architectural element is the Marina Bay Sands Hotel that rises above the ArtScience Museum on the bayfront, which appears to be a flower opening, as seen from below. Across the bay is the Singapore Flyer, a giant Ferris wheel that punctuates the skyline. The hotel’s three 55-story towers support a huge cantilevered deck, the largest in the world, which includes a sky-high infinity pool. It can support more than four A380 jumbo jets. I visited the hotel on my way to the adjacent Gardens by the Bay, a fabulous array of 16-story tall, palm-shaped steel structures that are covered with plants and tropical flowers, making them huge, lofty vertical gardens. Dubbed “Supertrees,” they are solar-powered to provide colorful evening displays, and are dazzling, to say the least. 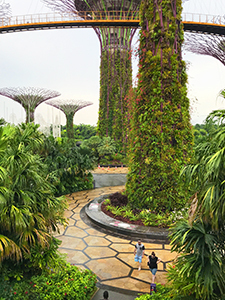 Gardens by the Bay isn’t the only great green area of the city. Another is the Singapore Botanic Gardens, a beautiful haven of well-manicured lawns interspersed with stately trees and bushes. Flowers bloom everywhere. 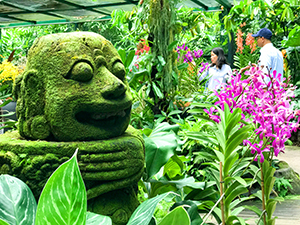 The highlight of the 150+-year-old garden is the National Orchid Garden, a beautiful 7+ acres containing 1,000 orchid species, and double that number of hybrids. Entrance to the Botanic Gardens is free; the fee to enter to Orchid Garden is S$5 per adult, S$1 for seniors and free for children. Plain and simple, more than anything else, Singapore is a food town (see For Singaporeans, It’s Food First!). In fact, some consider Singapore one of the best, if not the best, food cities in the world. It is so celebrated that celebrity chefs from around the world – including Joël Robuchon, Wolfgang Puck, Gordon Ramsay, and Andre Chiang, among others – have set up shop here. But you don’t need to traipse to celeb restaurants in hotels to do some gourmet grazing, however. You’ll also find numerous food stalls, called “hawkers” by Singaporeans, providing excellent meals all over the city. 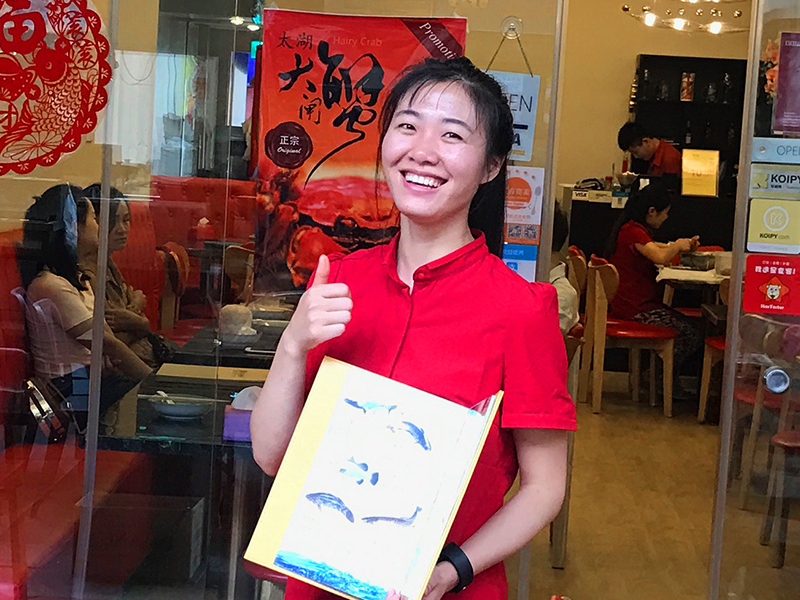 Two of them – Hill Street Tai Hwa Pork Noodle at Crawford Lane, and Hong Kong Soya Sauce Chicken Rice and Noodle in Singapore’s famous Chinatown – are even starred by Michelin. That makes them the cheapest places to find a Michelin-starred meal in the world. Beyond food, the city is also known for its chic shops and boutiques, many of which make home on Orchard Road, Singapore’s opulent shopping street that’s filled with upscale stores and shops, bars and cafés. 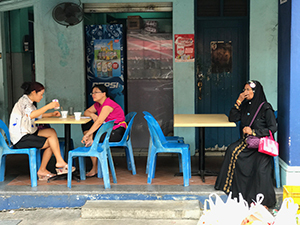 In addition to the brand names in the malls on Orchard Road, many fashionistas also seek out little Haji Lane in Kampong Glam, the old Muslim area of the city. There trendy boutiques pepper a neighborhood of small restaurants and cafes, some with wonderful graffiti-murals. It’s a very picturesque area and a pleasure to walk around, and I discovered its cafés to be good places to pause for lunch. The neighborhood mosque attracts tourists, as well. 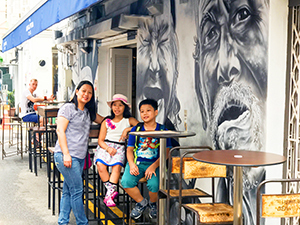 There’s also a lot to see (and eat) in Singapore’s Chinatown, the base of the country’s large ethnic Chinese population. Here you’ll find hawkers offering every type of Chinese food imaginable, as well as numerous shops selling ethnic merchandise. The same holds true for the city’s Little India, home to backpacker hostels and a more bazaar-like environment. While Little India and Chinatown are both interesting and colorful, I found I enjoyed the more orderly environment of Haji Lane and its Kampong Glam neighborhood the most. The Singapore Art Museum and the National Gallery Singapore are home to a wealth of contemporary Southeast-Asian art. Pinacothèque de Paris, the largest private art museum in the French capital, and which recently opened in Singapore, will certainly add fuel to the city’s artistic fire with its collection that includes works by Picasso, Monet, and Van Gogh. In addition, you’ll find great art beyond the city’s museums, as well. 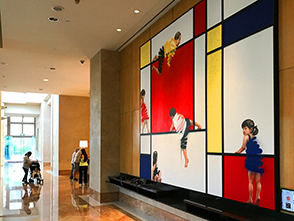 Some time ago I had heard about the art collection at Singapore’s Ritz Carlton, and I made a mental note to visit the hotel. En route to the Gardens by the Bay on my second day in Singapore, I stopped at the hotel to find out about the collection. I picked up a brochure at the guest desk that described the treasure trove of some 4,200 pieces of artwork, all created by such geniuses as Henry Moore, Andy Warhol, Zhu Wei, among others. Although I couldn’t run rampant through the property tracking down all of them, I did find plenty in the lobby and public areas. There some beautiful works by Frank Stella and Dale Chihuly satiated my appetite. That’s something the city’s hawker stalls do well also. I’ve visited Singapore several times, but not in the last 20 years. After reading you article, it seems like I’ve missed a lot. Thanks for the update. I’m glad you liked it Stan. It’s an incredible city I’m certain you’ll enjoy. I absolutely love Singapore. There’s so much to do and see. The food at the markets is unbelievable. Luckily for me I have a friend who lives there, so it’s an excuse to keep on visiting!